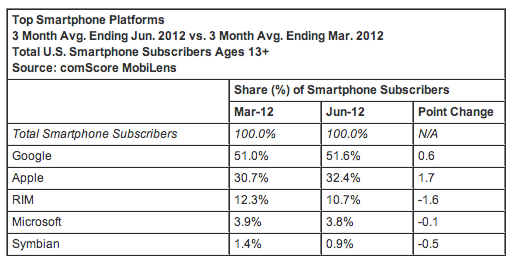 Yesterday, Comscore released their their quarterly report on mobile subscriber market share. 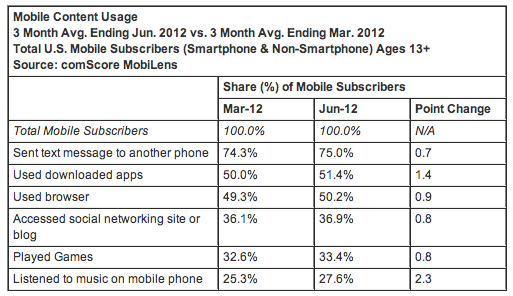 The report focuses on what phones US mobile subscribers are using. ComScore’s data is based on a survey of 30,000 US consumers. But what I found really interesting in the report was the mobile content usage that ComScore shared. How consumers prefer to consume content, of course, affects how marketers and brands decide to deliver that content. This is especially important in the mobile content space considering most entities have to build new systems for the mobile experience, or at least optimize for it. As smartphones have advanced, mobile apps have gained more and more traction. In December 2011, ComScore’s numbers showed that US smartphone consumers are using downloaded apps more than their web browser (47.6% compared to 47.5%). And since then the trend has continued (apps 51.4%, browser 50.2%) with app usage growing at a faster clip . 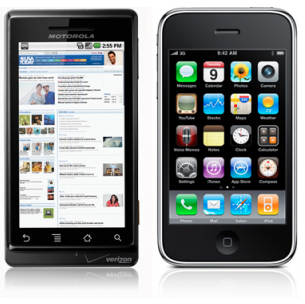 Both are used at high rate, at more than half of smartphone users, and have only one percentage point separating them. So the question becomes less about whether brands should develop a mobile app OR a better mobile browser experience, and more that they need both. Translating the success of mobile apps to a brand experience is tough. Some service oriented businesses, like airlines, hotels, and software, can translate their systems for loyal customers and it makes a lot of sense. But other brands have to find a way to become a utility if they want their app to be more than smartphone pixels. Just as most brands have had to build a website and build a Facebook presence, it is now time for them to build a better mobile experience. The mobile web is the easiest place to start. The question is, how do brands better capitalize on the consumer love for apps?